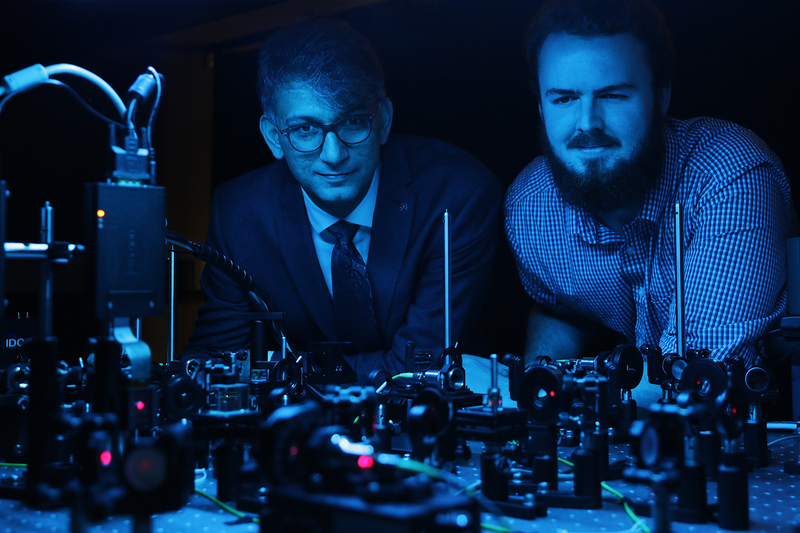 Professor Ebrahim Karimi, a member of uOttawa’s Department of Physics and holder of the Canada Research Chair in Structured Light, and doctoral student Frédéric Bouchard observe the setup they used to clone the photons that transmit information, called qudits. Quantum systems were believed to provide perfectly secure data transmission because until now, attempts to copy the transmitted information resulted in an altered or deteriorated version of the original information, thereby defeating the purpose of the initial hack. Traditional computing allows a hacker to simply copy and paste information and replicate it exactly, but this doesn’t hold true in the quantum computing world, where attempts to copy quantum information-or qudits-result in what Karimi refers to as “bad” copies. Until now. For the first time, Professor Karimi’s team was able to clone the photons that transmit information, namely the single carriers of light known as qubits, as well as quantum theory allows, meaning that the clones were almost exact replicas of the original information. However, in addition to undermining what was previously thought to be a perfect way of securely transmitting information, the researchers’ analyses revealed promising clues into how to protect against such hacking.